The local cycling communities of Australia should be proud. 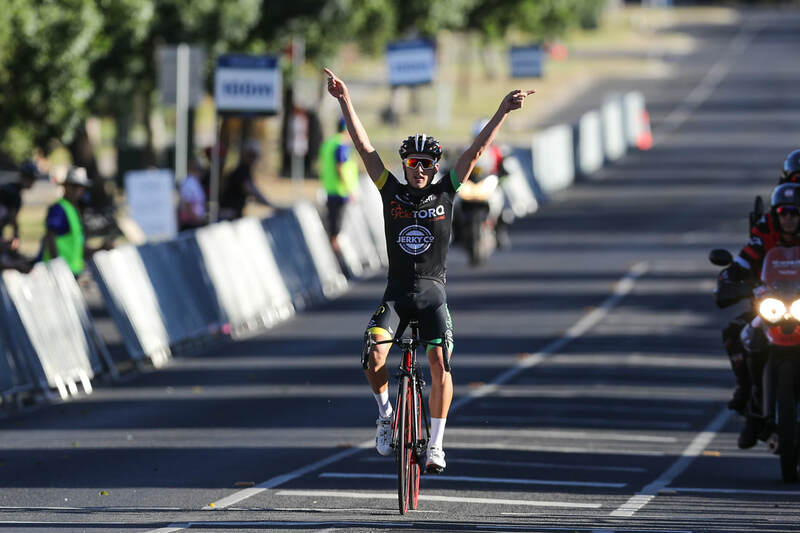 This blend of young Australian cycling men are an aggressive racing pedigree that engages crowds and keeps quality sponsorships within the sport. Attacking, fast, and willing to work for each other. But before we get to the results, let me paint a little picture for you. It’s 5:45 am on the Australian National Road course on Saturday the 6th of January 2018. Tents are being pitched, coffee vans are setting up, and the young men of Australia are warming up their elite legs. The racing schedule has been brought forward today. 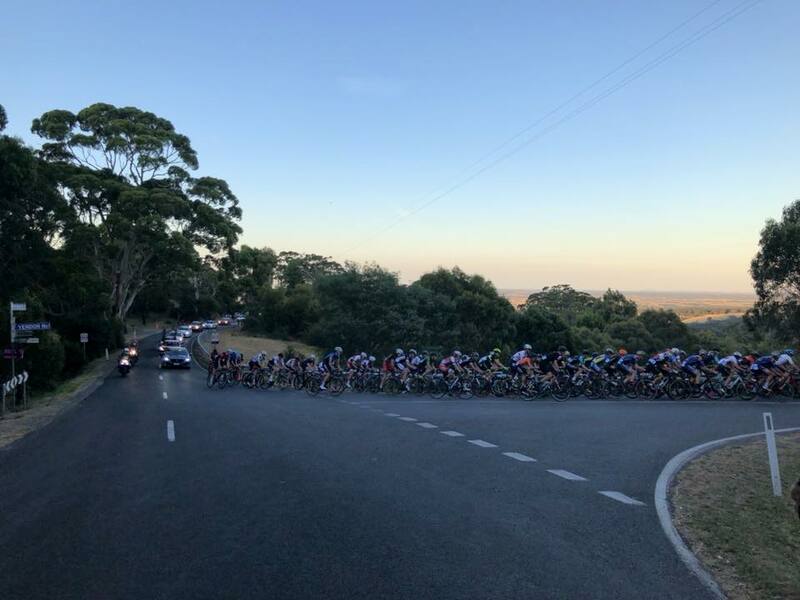 High winds and a forecast of 38 degrees has meant Cycling Australia has been required to collaborate with authorities to have all riders (U19 & U23 men and women races) off the course by 1 pm. The fire warning across Victoria is extreme. The fondo event for the general public has been cancelled and the men’s and women’s U19 and 23 events have been shortened. Come 6:30 am and it’s still dead quiet, yet the best young cycling men of Australia are warm and ready to start with exceptional speed. The early start to the men’s U19 road race at Buninyong. The sun is starting to rise on a day of severe fire warnings. With the race shortened to 6 laps/69.6 km (from 9 laps/104 km) it seemed obvious that the race would be ON from the very start, and it exceeded expectations. On the last three bell laps of a typical A Grade criterium, riders will pick up their speed and the bunch strings out. That was how the men’s Under 19 road race began. Less than 1 km into the race there was a crash involving 10-15 riders. No one got seriously hurt, but a few participants were out of the race with mechanical challenges. One rider was from Coffs Harbour. All that training, logistics and cost to get to Ballarat, only to see your race go down the drain within minutes from the start line. A brutal reminder of the ruthless nature of road cycling at times. It took less than one lap for riders to start popping off the back. With wind conditions blowing around 25-30 km per hour, and gusts of over 45 km, the bunch was disintegrating up the main climb, with a strong cross wind blowing riders off the back. While riders were attacking from the gun, it wasn’t until the third lap where three riders could convincingly break away. Victorian Carter Turnbull (InForm Make), New South Welshman Ben Metcalfe (Mobius Bridge Lane) and Western Australian Tyler Lindorff (WAIS) made aggressive moves up the climb and by the end of the third lap they’d gained 45 seconds over two riders on the chase (Samual Eddy and Zachary Johnson), with the rest of the field seven seconds behind the chase of two. Strung out all over the road by the end of lap three, this was a fiercely aggressive race. The bunch was fatiguing while riders continued to be dropped up each climb. By end of lap three there weren’t many more than 30 riders left out of a field of 85 starters. The breakaway of three that stuck. 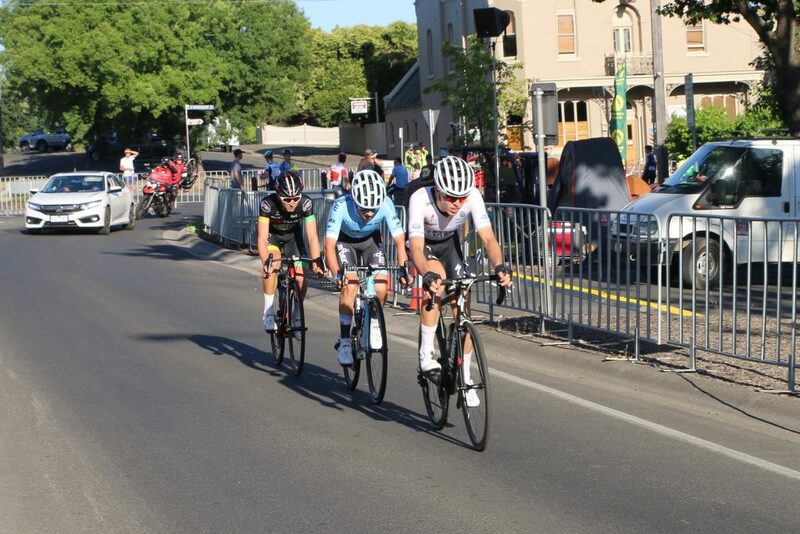 Victorian Carter Turnbull (InForm Make) at the front, New South Welshman Ben Metcalfe (Mobius Bridge Lane) and Western Australian Tyler Lindorff (WAIS). They made an aggressive move on the third lap to stay away. Speaking with Carter Turnbull (InForm Make – finished third) post ride: “The three of us worked together well in the break. With a strong cross head up the main climb and then a strong head wind turning left off the highway, it was important that we worked well together if we were to stay away”. At the end of lap 5 the bunch was a minute and 20 seconds behind the break. It was clear that the break of three would take the honours on the podium. 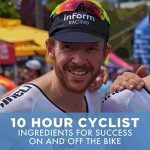 The most aggressive riders of the day would be rewarded for their efforts. Carter continued: “Tyler Lindorff hit hard at the bottom of the climb on the last lap, we (Cater & Ben) tried to go with him but he was too strong. We then found it hard to wind Tyler back as no one wanted to sacrifice their ride”. Perched at the finish line commentators were anticipating either Carter or Ben to be off the front, if anyone. If it was to be a bunch finish, Tyler’s sprint capabilities had the commentators putting Tyler in first position. To everyone’s surprise we saw Tyler come in solo, not just by a few seconds, but a whopping 50 seconds. Ben Metcalfe took Cater for what appeared to be a fatigue inflicted sprint for second, with Rudy Porter (InForm TM Insight) going off the front of the remnants of the main bunch for fourth place. Of the 85 starters, 30 finished, with young 16-year-old Ben Jones rounding out 30th place. Post-race, winner Tyler Lindorff was quizzed as to why he would attack on the last climb when he had the sprint capability to take the win. His response was classy and summed up the aggressive race culture that is brewing within the younger ranks of Australian cycling. “I wanted to prove to myself and everyone else that I was at the level.” The “level”, I assume, is an elite racing machine that’s ready to take on the world. And judging by the racing that was on display on Buninyong this morning at an U19 level, I am certain there’ll be a few who follow Tyler’s lead to overseas success. 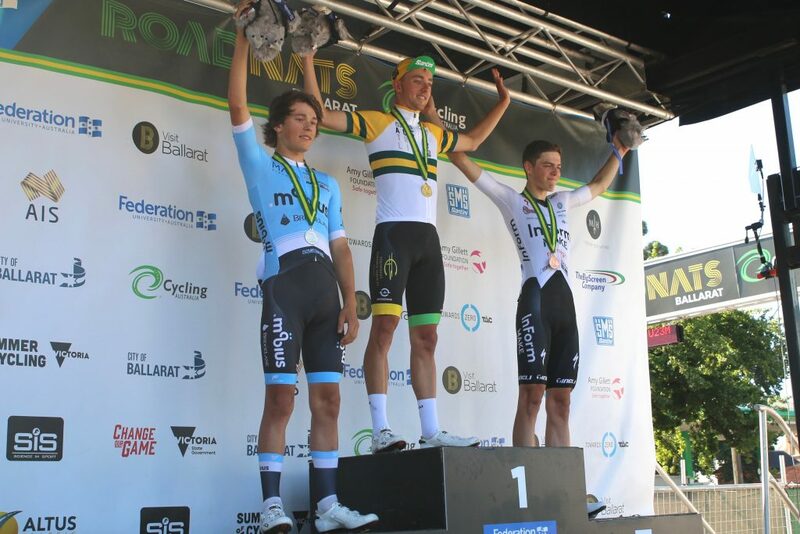 The breakaway of three that became the podium in the Men’s U19 Australian National Road Race. Victorian Carter Turnbull (InForm Make) third, New South Welshman Ben Metcalfe (Mobius Bridge Lane) second, and Western Australian Tyler Lindorff (WAIS) the champion.